ToyoMotors Auto Care is the premier North Phoenix Green Shop! We care about the future of this planet, and will work and act accordingly. That’s right, at ToyoMotors, we accomplish your auto repair and maintenance service with green shop practices. For several years we at ToyoMotors Auto Care have searched for reasonable and cost-effective ways to protect our environment and conserve resources. Our quest has led us to examine front-office processes, parts-management programs, housekeeping, parts cleaning and degreasing, fluid recycling, and energy-use policies to reduce or prevent pollution. At ToyoMotors we go beyond the government environmental regulations all automotive repair facilities must meet. Cleaning and Degreasing – We only use low-hazard, low-pollution solvents or water-based cleaning. Waste Fluids – Recycle and reuse fluids whenever possible. Housekeeping – Practice spill prevention, seal shop floors, recycle fluids. Energy Conservation – Save energy with efficient lighting, “green” office equipment, energy-efficient air conditioning, and other shop equipment. Water Conservation – Properly maintain plumbing, install low-water use fixtures, use of zero-landscaping and dry-floor clean-up procedures. Waste Reduction – Reduce paper use, recycle as many other materials as possible, buy and use recycled products when practical. 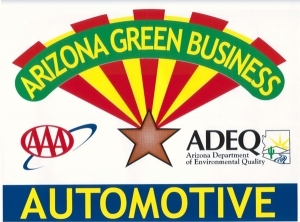 ADEQ has partnered with the Automotive Service Association, ASA of Arizona, and the City of Phoenix to certify auto repair shops under the Arizona Green Business Program. The scope of this program includes not only pollution prevention activities, but also resource conservation (energy, water and recycling) efforts. This voluntary program gave ToyoMotors auto service and repair an opportunity to promote an environmentally friendly approach to car repair. As a “Green” automotive shop, we set high standards for pollution prevention and resource conservation – standards for other industries to follow. Our automotive facility has received the Arizona Green Business certification and displays a sign with the Green Business logo, proudly showing customers that we are doing our part to protect and clean up our environment. As an innovator of Green Shop practices, Neil Geesey and the team at ToyoMotors were involved at inception of the Green Shop Program. Neil had board input with ADEQ, and is proudly serving as an Arizona Shop Inspector. 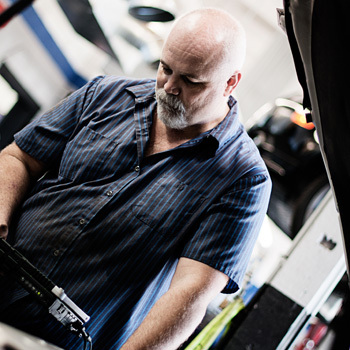 We are trained and capable of performing service and auto repair on your hybrid vehicle. You probably are well aware that the hybrid vehicle has many specialty components and systems that require expertise and knowledge to care for, of course not every facility is capable of hybrid care. That has caused many to feel as though the dealer is your only option. Well rest assured that whether you have chosen the Toyota, Honda, Lexus or even domestic hybrid vehicle, at ToyoMotors Auto Care, we have the training and expertise to keep your hybrid vehicle running as smoothly and efficiently as possible for years to come.